Chop your veggies: mince the onion and garlic, chop the mushrooms and green pepper into tiny pieces, cut the zucchini into long sticks and then dice into ¼” cubes. Brown ground turkey in large pot, breaking up the meat with a spoon or spatula. Add the onion and garlic, sauté until translucent. Add mushrooms and green pepper, sauté a few more minutes, throw in the zucchini. Add the tomatoes, sauce, and seasonings. Bring to a boil, then reduce heat and let it simmer uncovered for 30 minutes or so, stirring every so often. Taste and adjust seasonings as necessary; if it feels a little blah, add more of your herbs, ground black pepper, or red pepper flakes. If it is too acidic, add a half teaspoon more sugar. Make (or thaw) your sauce. 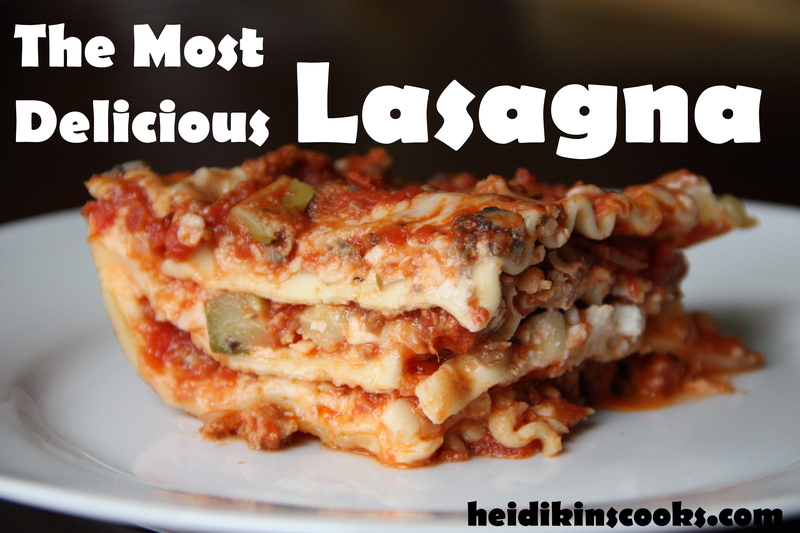 While it is simmering boil a large pot of water and cook your lasagna noodles. I put them in a few at a time and when they are done I pull them out with tongs and let them drain on a wire rack over my sink. In a bottom of a 9×13 glass pan spread 1-2 cups of sauce. Then add a layer of noodles topped with ricotta cheese. I use a tablespoon or regular soup spoon and put 3-4 dollops of ricotta on each noodle. Then add about a cup of mozzarella cheese and top with a healthy portion of sauce, about 2-3 cups, don’t be stingy. Keep laying noodles, ricotta, mozzarella, and sauce three more times. On the last layer after the sauce add a ½ cup of Parmesan cheese. Spray the inside of your foil (so the melting cheese doesn’t stick) and cover. You can bake immediately for 50-60 minutes, let it cool for 10-15 minutes before you cut and serve (this helps the sauce not be so runny). This is more delicious if you put it in the fridge overnight, bring to room temperature, and then bake. Or put it in the cold oven, set the temperature to 375 and the timer for 1 hour 20 minutes, again letting it cool 10-15 minutes before eating. OR you can freeze this (put two or three layers of foil on the top), thaw in the fridge 24 hours, and then bake. Whew! That’s a lot of options! Regardless of your baking preference, this will be absolutely delicious!! Several people who vehemently told me “I really don’t like lasagna that much” came back for seconds and thirds. 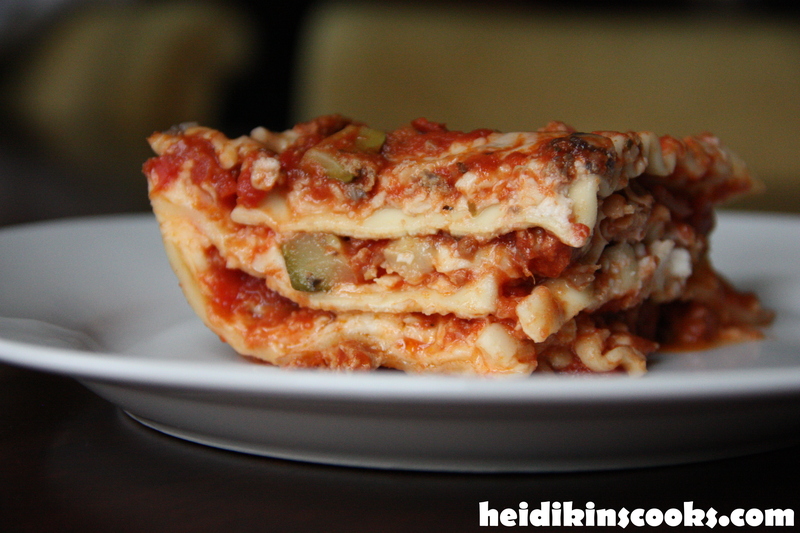 *Confession, warm lasagna is impossible to photograph well. The slice above was completely cold when I took my pics because that way it stays in cute little layers without slopping (deliciously!) all over your plate. ← Table setting with gold and navy. And antlers.